Take a peaceful few moments this spring to relax and be creative. 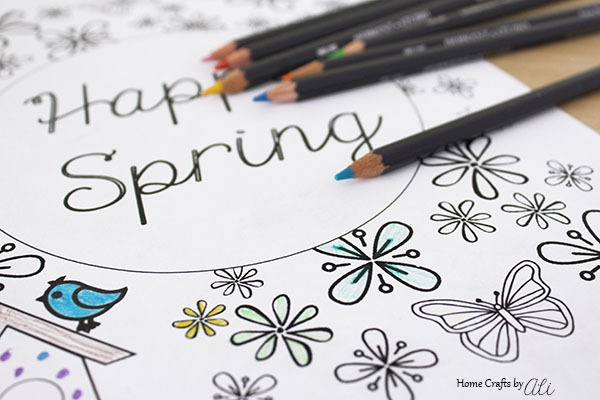 Print out this Happy Spring coloring page, gather your favorite colors of pencils or pens, and color the afternoon or evening away. Oh how I love springtime! The pretty colors of the flowers and blossoms on the tree, hearing the birds chirping, planning my garden, listening to the soft raindrops on the roof of the house, and many more things. I thought it would be fun to create a coloring page with some of the wonderful parts of springtime for you to enjoy. This project is part of the monthly challenge for the Inspire My Creativity group. Once a month there is a theme and all of the co-hosts create a new project, then we open the link party to anyone who wants to add a project having to do with the theme. 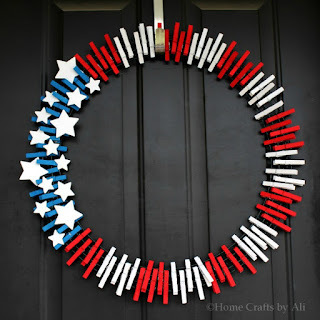 Check the end of this post for more inspiration for Spring project ideas. 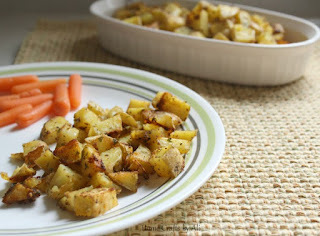 If you are a blogger, feel free to leave a link to any post having to do with Spring. I love having a creative outlet that lets me relax and when I'm done I can use my project in different ways. Coloring pages are so versatile - they can be framed, glued onto canvas, made into bookmarks, used as gift wrap, used to decorate notebooks, and so many other projects. I decided to frame my print when I finished coloring it. It makes a nice addition to my Spring decor mantle. 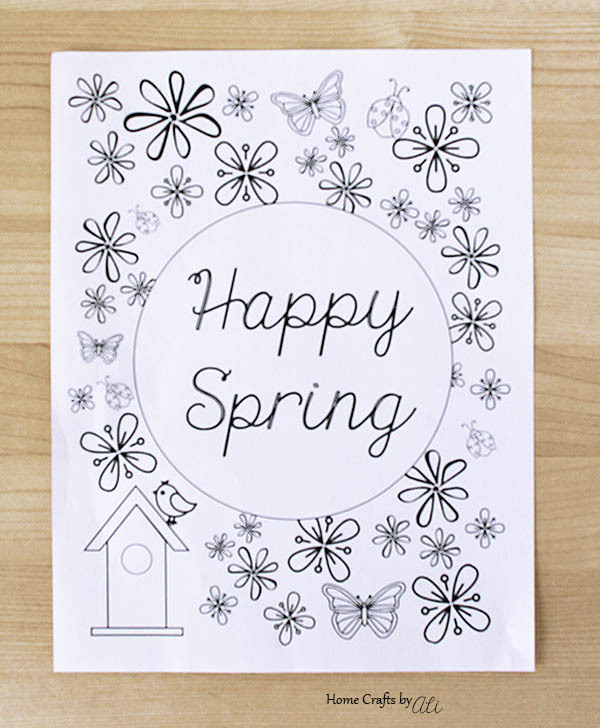 Print out a free PDF copy of this fun Happy Spring coloring page and color your cares away. 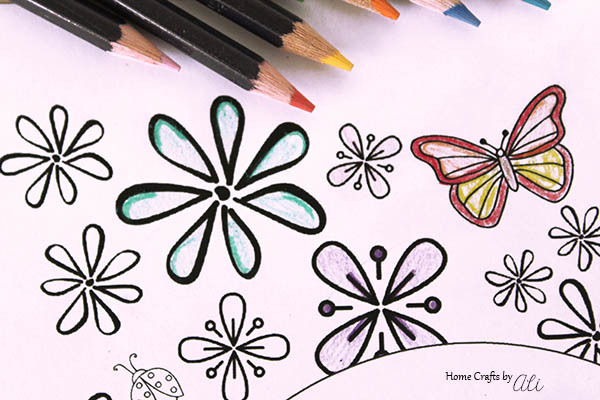 Use your favorite pens, pencils, markers, or even watercolor paints to fill in this coloring page. Print a few copies so you can try the different mediums. 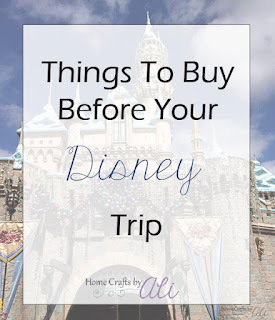 Click here to download the PDF file that fits onto letter size paper - use cardstock for framing or bookmarks, or use regular printer paper for other projects. The printed copy will not have my watermark on it, so it won't be in your way when coloring. 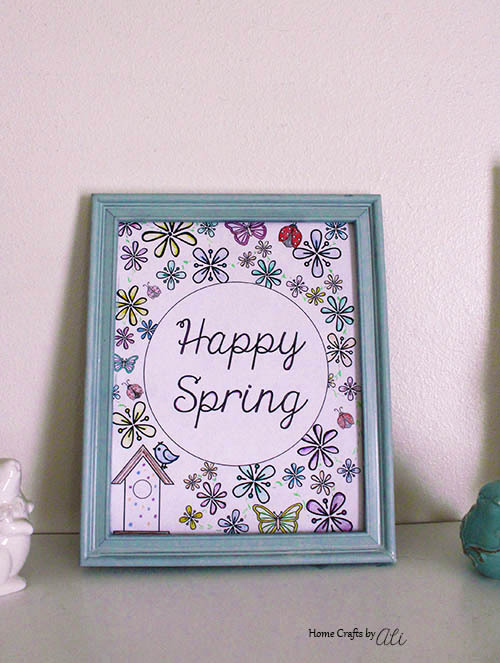 After you finish coloring your spring printable, you can use it in many different ways. I spray painted a frame with my favorite chalk paint (Rust-Oleum Chalked in Serenity Blue) then put my coloring page in and added it to my mantle. 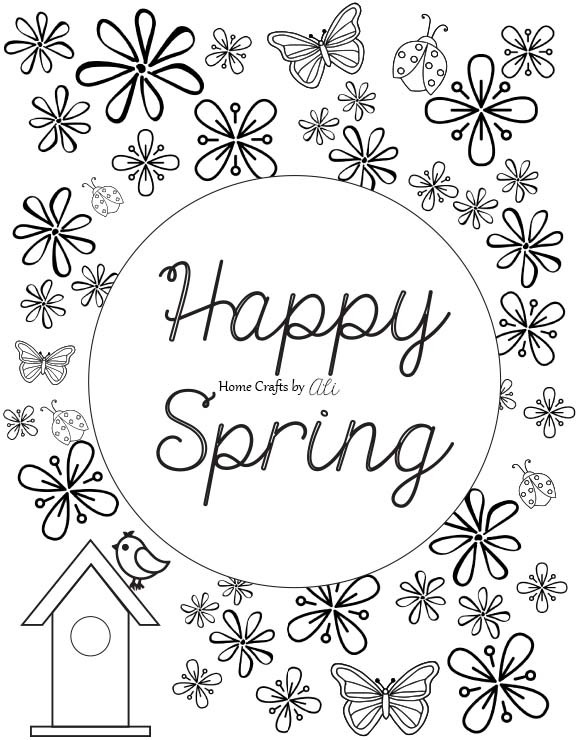 I hope you like this Spring coloring page! What is your favorite part of spring? Let me know in the comments! As I mentioned at the beginning of this post, the crafting group Inspire My Creativity, is hosting a craft challenge link up once a month. 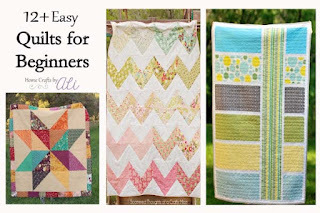 We create a new post each month to go along with our theme and share the tutorial on our pages, as well as hosting a link up for other people to share their projects that fit out monthly theme. We will share on social media the posts linked up to this party! 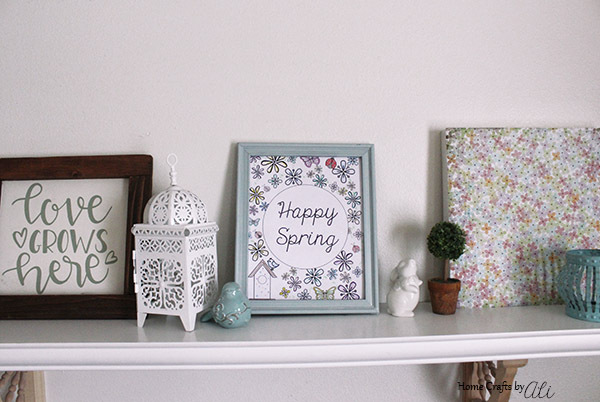 Share your Spring projects below and let's inspire some creativity! Mark your calendars for Wednesday May 9th for our next link party! We will be sharing a new challenge project on the 2nd Wednesday of the month. 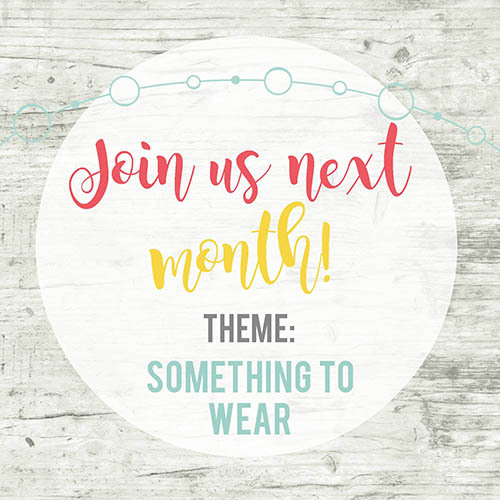 Here's a sneak peek at our theme for next month, we would love to have you create a project and share at our next link party! What a cute coloring page! Thanks for sharing! Such a cute coloring page. A fun project for just about anyone. May have to print this out for my artsy daughter to keep her busy! Visiting from Inspire My Creativity party.